We always like to support the local communities in which we build and this year is no exception. 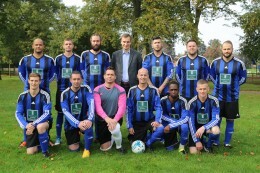 Our latest sponsorship deal is a new kit for FC Pochin in Leicester, who are currently riding high in the Sunday Alliance Football League Division 3. By coincidence one of our Assistant Site Managers, Jordan Cunningham plays for the team and in a recent game acquitted himself admirably by scoring two of the winning goals.